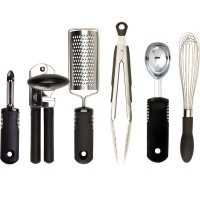 Practical kitchen utensils for those with mobility and/or hand dexterity issues include spoons, forks, jar openers, paper towel dispensers and more! The Ableware Universal Built-Up Handle is an ergonomic, soft, built-up handle that makes it easier for people with arthritis or limited grasping ability to self-feed and perform other activities of daily living. 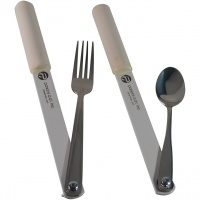 This multi-purpose handle easily and instantly creates a larger gripping surface on most standard eating utensils - forks, knives, spoons - thereby eliminating the need for special built-up utensils. 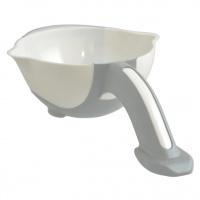 The soft, ribbed handle fits comfortably in the hand and reduces pain and cramping. It can also be used with other everyday items such as pens, pencils, toothbrushes, crochet hooks, knitting needles and more! --1.75" diameter handle accommodates standard utensils with widths from 1/4 - 1"
Dimensions: 13.5" x 10.5" x 1"
The case of the runaway veggies has just been solved. The OXO Good Grips Chop & Pour Cutting Board makes chopping and transporting ingredients simple and efficient. Use the Board's corner spout to neatly guide food from the Board directly into bowls, pots or pans without spilling onto stovetops or counters. A generous, flat cutting surface allows for efficient slicing and dicing, while the raised back and side walls keep food contained. The lightweight Board and soft, tapered handles make lifting easy. The Board is made of durable, non-porous, odor-resistant polypropylene that resists deep scratches and won't dull sharp knives and non-slip edges keep the Board from slipping. Dishwasher safe. 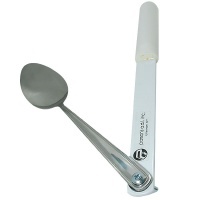 Stainless steel utensils fastened with wing nut to a light weight aluminum extension handle. 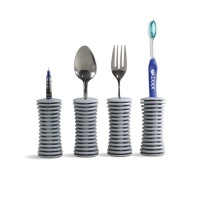 The utensil adjusts to any angle, right or left hand. For persons with limitations in upper extremity of motion. 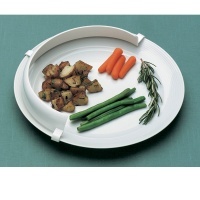 Fits plates with diameter of up to 10.75"
This strong SureFit Plastic Food Guard hugs the rim of a dish securely. Designed to help the scooped food fall back onto the utensil, thus reducing messy spills off the edge of the plate and general embarrassment, and supporting independent eating. Guard measures 1.25" high and fits plates with a diameter of up to 10.75". Ideal for one-handed use. Easy to attach and remove. Microwave and top rack, household dishwasher safe. Color: White.